I was unsure all over again but I went it with as you should - if you’re ever in Italy, especially in the North. It’s a big part of their culture and one way to try a varied selection of Italian food one small bite at a time. It sounds a lot like tapas and while there are similarities, it’s also very different. The closest thing that comes close in Nigerian culture is going to Giwa Barracks or Fowler after work. So how does Aperitivo work? First things first, it’s not like your typical Happy Hour where there you can expect discounts on drinks. During aperitivo, drinks are full price and food is complimentary. The food can be served in two styles - buffet style and for lack of a better term, “surprise style”. As the name implies, with buffet style, the food is laid out at tables free for all. This is technically not an “Aperitivo”, but an “Apericena”. The Italians I was with called it an Aperitivo and it’s their country so yeah, I guess I can call it an Aperitivo too. Basically, you can dig in to as many helpings once you’ve placed your order for the first drink. The place I visited followed this style and the spread was quite impressive. Multiple pasta styles, cured meat, varied bread selection including focaccia, fresh mozzarella, veggies, dessert, chicken, sausages. I could go on. For the “surprise style”, the food selection isn’t really up to you. Your server brings out a plate of food with each drink order you place. I’m told that the food you receive progressively gets “better” the more you order drinks. I would have imagined that the reverse would be true because drinking all that alcohol means you’re less likely to notice the food is getting better. My guess is that, unlike Americans or Brits, the Italians drink to enjoy their liquor and not to get plastered. What kind of drinks do people order during Aperitivo? You can expect to see most people start with an Aperol Spritz. 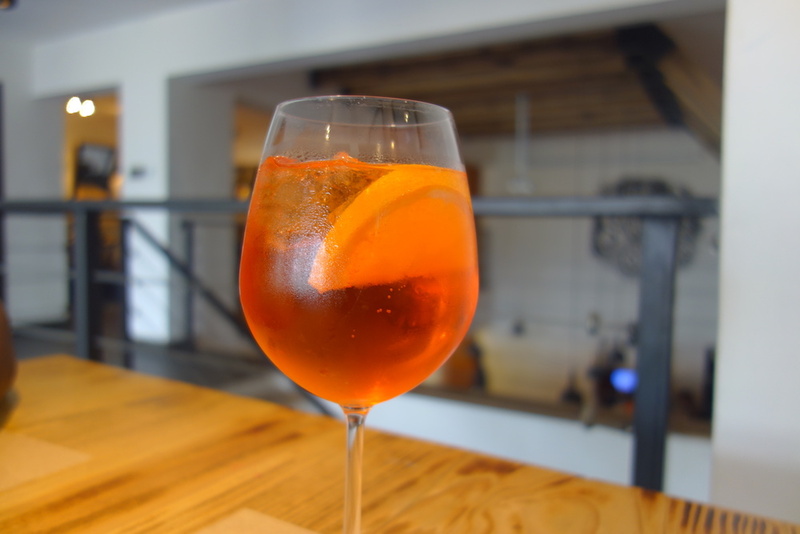 It’s a classic Italian drink made with Prosecco, Aperol and soda. It’s not my speed because I find it a tad bitter but Italians don’t care what one ‘Folly from Lagos’ thinks. There’s a good reason to go with a “bitter” drink, however. Anything sweeter will definitely not pair well with all the food you’re about to eat. Also, if you’re trying to enjoy your drinking, it’s probably wise not to get something sweet. If your drink is on the sweet side, you’re likely to drink a lot more and if you drink a lot, you get very drunk. It is their drink of choice and you’ll find this sold on every street corner and even as take away. Wine is also a very typical aperitivo drink while classic cocktails are not. In our group of five, I was the only the only person who stuck to classic cocktail blends. I did have a Tom Collins to start. Unlike Happy Hour, aperitivo doesn’t discriminate for those who don’t drink. Mocktails, sodas, juices and the likes definitely pass the drink order requirement to get in on the complimentary food. For the buffet style, prices typically start at 10 Euro per person and that includes one drink. You can eat as much food without ordering additional drinks but you probably will. For bars where you are served one plate at a time with your drink, you don’t pay a separate cover charge for food. Instead, you pay per drink. It’s a very good idea if you’re a little light in the wallet. I thoroughly enjoyed my first aperitivo experience and highly recommend 10/10; it’s such a unique cultural experience that just happens to be delicious. For most Italians, aperitivo doesn’t replace their main dinner but the amount of food Italians eat is a story for another day. The restaurant I visited was buffet style so naturally I ate quite a bit over multiple courses so it certainly replaced my dinner. I found the food to be worth the 15 Euro price tag. I mean, they had fresh mozzarella and I could take as much as I liked. Over the course of this week and next, I have a few travel experiences coming up, including my experience at the Michelin starred Il Buco Sorrento.